As most of you would be aware of by now, I am mad for coconut oil. It is one of those multipurpose super foods and hands down one of the best products available is that from the divine INDAH range. Last week I shared with you why I clean my face with oil, and spoke specifically about why coconut oil is one of my must have items. Recently I had the pleasure of meeting Teisha Lowry, the brains behind Indah – a deluxe range of all natural and purely organic body care, fragrances and virgin coconut oil – and asked her to share a few tips with us. My No.1 beauty secret is here. I have been using this miracle oil for years and I want share this little secret with you. I truly believe it has worked wonders for my skin and it keeps my insides healthy too. It’s affordable, smells delish and you can eat it. Say hello to vibrant hair and skin!!! My Extra Virgin Coconut Oil uses wild-organic coconuts, which are grown in rich volcanic soil on the slopes of Mount Agung, East Bali, all HAND-PRESSED leaving vital proteins and enzymes. It softens dry skin whilst healing it, removing dead skin cells and encouraging new, healthier tissue without feeling greasy; it is the perfect skin drink. The mother of all SUPERFOODS helps fight off free radicals that are attacking your cells. Our EVCO is 55-57% high in Lauric Acid, one of the highest available on the market. Lauric acid is a medium chain fatty acid, which has the additional beneficial function of being formed into monolaurin in the human body. It’s sent straight to the liver where it’s converted to energy, without giving the body that sugary spike. Monolaurin is antimicrobial, antibacterial and antiviral which destroys lipid-coated viruses such as HIV, flu and bacterial infections. Lauric acid can only be found naturally and is also prominent in the saturated fat of human breast milk, giving vital immune building properties to a child’s first stage of life. Outside of human breast milk, nature’s most abundant source of lauric acid is coconut oil. INDAH’s Extra Virgin Coconut Oil is free from all chemical processing, without added preservatives and artificial flavours, therefore it comes to you in it’s rawest form, providing your body with purest form of Extra Virgin Coconut Oil on the market. 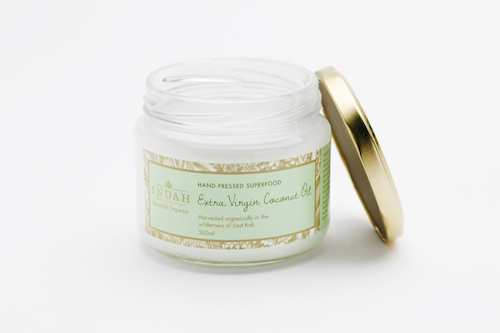 ALL of INDAH’s body care and fragrances are based with this exact Extra Virgin Coconut Oil. A lot of other beauty brands use a processed version in their manufacturing leaving out the important nutrients and acids, so it’s more cost affective for them. However, INDAH uses the natural oil itself, which is derived via hand-pressing the oil from fresh coconut flesh, which has kept its full set of medium chain fatty acids. That means it is much better for you and your wellbeing. Daily ritual – I take up to three tablespoons daily for internal health and wellbeing, it gives me pure energy especially before a workout. (But that is just just me). Body moisturiser – The best skin drink! It softens dry skin whilst healing it at a cellular level, at the same time removing dead skin cells and encouraging new, healthier tissue – without feeling greasy, it sinks right in. Lip Balm – dry or chapped lips can occur from when the body isn’t supplying the oil protection it needs, lips can suffer from dehydration or cold weather conditions. Make-up remover – my personal favourite remedy. Only oil can break through oil, so I smother it over my face and let it soak in for about 15 minutes and then wash off. Perfect for when you have a face full of makeup (models – take note). Hair treatment – it is seriously THE BEST hair treatment. I guarantee you won’t need to spend $50 on a bottle of Moroccan oil ever again. I smother my hair and scalp in this overnight, wash out in the morning and voila, soft shiny hair without the residue.